Although chromosome missegregation during oocyte maturation (OM) is a significant contributor to human morbidity and mortality, very little is known about the causes and mechanisms of aneuploidy. Several investigators have proposed that temporal perturbations during OM predispose oocytes to aberrant chromosome segregation. One approach for testing this proposal is to temporarily inhibit the activity of protein proteolysis during OM. We used the reversible proteasome inhibitor MG-132 to transiently perturb the temporal sequence of events during OM and subsequently analyzed mouse metaphase II (MII) for cytogenetic abnormalities. The transient inhibition of proteasome activity by MG-132 resulted in elevated levels of oocytes containing extra chromatids and chromosomes. The transient inhibition of proteasome-mediated proteolysis during OM by MG-132 resulted in dose-response delays during OM and elevated levels of aneuploid MII oocytes. Oocytes exposed in vitro to MG-132 exhibited greater delays during metaphase I (MI) as demonstrated by significantly (p < 0.01) higher levels of MI arrested oocytes and lower frequencies of premature sister chromatid separation in MII oocytes. Furthermore, the proportions of MII oocytes containing single chromatids and extra chromosomes significantly (p < 0.01) increased with MG-132 dosage. These data suggest that the MG-132-induced transient delay of proteasomal activity during mouse OM in vitro predisposed oocytes to abnormal chromosome segregation. Although these findings support a relationship between disturbed proteasomal activity and chromosome segregation, considerable additional data are needed to further investigate the roles of proteasome-mediated proteolysis and other potential molecular mechanisms on chromosome segregation during OM. Although numerous hypotheses have been proposed to describe the etiology of aneuploidy in human gametes, the only steadfast association remains maternal age [1, 2]. Besides this association, very little information is available about the numerous potential mechanisms that may disrupt normal chromosome segregation in oocytes. Based on studies involving compounds that alter microtubular kinetics and induce both cell-cycle delay and aneuploidy, several groups have proposed that temporal perturbations during mammalian oocyte maturation (OM) predispose oocytes to aneuploidy [3–6]. In addition to faulty microtubule kinetics, perturbations during OM may also stem from abnormal function of centrosomes, kinetochores, spindle checkpoints proteins, the anaphase-promoting complex (APC), the securin-separin-cohesion complex proteins, and the proteasome . OM encompasses the nuclear and cytoplasmic changes that occur during the transition from the dictyotene stage of meiosis I to metaphase II (MII). During this transition, tightly-regulated post-translational phosphorylation-dephosphorylation events and proteasome-mediated proteolytic reactions regulate the activation and inactivation of signal transduction pathways that control chromatin condensation, nuclear membrane dissolution, microtubule nucleation, and formation of a haploid oocyte [8–10]. Several kinases that exert major roles during OM include maturation promoting factor (MPF) [9, 11], mitogen-activated protein kinases (MAPKs) [12, 13], and the product of the c-mos protooncogene Mos kinase [14, 15]. Also, during OM oocytes undergo two highly-regulated metaphase-anaphase transitions (MAT) in which homologous chromosomes are equally and randomly segregated to an oocyte and first polar body and a subsequent division in which equational division of sister chromatids results in a haploid oocyte and a second polar body. The MATs are predicated upon the coordinated activities of the spindle checkpoint [16, 17], the anaphase-promoting complex (APC) or cyclosome [18, 19], the proteasome [20, 21], and the cohesion-complex proteins involved with chromosome cohesion and separation [22–24]. Alterations in the temporal sequence of these coordinated activities may potentially predispose cells to faulty chromosome segregation. Abnormal chromosome segregation has been observed in mice lacking the Mad2 checkpoint protein . The spindle checkpoint utilizes sensory proteins that detect kinetochore-microtubule tension and occupancy and transiently block anaphase until all of the chromosomes are properly attached to microtubules [16, 26, 27]. Although the mammalian spindle checkpoint appears to differ between mitosis and meiosis, the two meiotic divisions, and male and female germ cells , anaphase subsequently follows stable kinetochore-microtubule attachments [17, 29] in both vertebrate mitotic  and meiotic  cells. The APC is a large protein complex that ubiquinates mitotic cyclins and other regulatory proteins that are destined for timely proteolysis by proteasomes [10, 20]. Proteasomes are multicatalytic 26S proteases consisting of a 20S central core catalytic subunit bordered by two 19S components [32, 33] which hydrolyze C-terminal peptide bonds to acidic, basic, and hydrophobic amino-acid residues [20, 34]. Proteasomes proteolyze securins which inhibit separase activity. Separase is needed for inactivating cohesions and enabling sister chromatid separation [35–37] in both fission yeast  and mammalian cells . Although differences have been reported among species  and cell types , it appears that the majority of cohesion is removed from mammalian chromosomes during prophase and prometaphase; whereas, a lesser amount remains at kinetochores until anaphase onset. Proteasomes translocated to meiotic spindles of rat oocytes and MG-132 induced-inhibition of proteasomal activity resulted in partial segregation of chromosomes during meiosis I . Moreover, defective proteasomal activity in fission yeast impaired chromosome segregation . To test the hypothesis that transient inhibition of proteasomal activity during mouse meiosis I was associated with chromosome missegregation, mouse oocytes were exposed in vitro to the reversible proteasome inhibitor MG-132 and metaphase II (MII) oocytes were analyzed for structural and numerical chromosome aberrations. This transient arrest of proteasomal activity represents a perturbation during the normal temporal sequence of events during OM. Transient exposure of mouse oocytes to MG-132 for 6 h followed by washout of the compound and an additional 17 h culture in vitro enabled exposure of cells during meiosis I and sufficient time for them to progress to metaphase II. Although the majority of MII oocytes were classified as normal (Fig. 1A), the data indicated that MG-132 induced a dose-response perturbation or delay in the rate of OM and an increase of single, unpaired chromatids and hyperploidy in MII oocytes (Table I). The significant (P < 0.01) increase in the proportion of MI oocytes (Fig. 1B) in the 10.0 mcg/ml group relative to the other groups and the significant (P < 0.01) decrease of oocytes exhibiting premature centromere separation (PCS) (Fig. 1C) in the 10.0 mcg/ml group relative to the controls suggest that proteasomal inhibition retarded the rate of OM. An inverse relationship has been shown to exist between the proportions of arrested MI oocytes and MII oocytes exhibiting PCS . The significant (P < 0.01) dose responses of higher frequencies of MII oocytes with single chromatids (Figs. 1C,1E) and of hyperploidy (Figs. 1D,1E) suggest that the MG-132-induced transient inhibition of proteasomal and calpain activities during meiosis I predisposed oocytes to abnormal chromosome segregation. When oocytes were continuously exposed to 0.0, 0.5, 5.0, 25.0 or 50.0 μg/ml MG-132 from one h after initiating the culture until 17 h later, the proportions of MI arrested oocytes were 5.7% (5/87), 12.3% (14/114), 39.3% (44/112), 100% (98/98), and 100% (91/91), respectively. Of the MI oocytes in the 25.0 and 50.0 μg/ml MG-132 groups, 68.2% (30/44) and 100% exhibited diffuse chromatin (Fig. 1F); whereas, those oocytes continuously exposed to 0.0, 0.5 or 5.0 μg/mlMG-132 did not display diffuse chromatin. Additionally, the proportions of MI oocytes displaying homologue separation (Figs. 1G,1H) in oocytes transiently exposed to MG-132 for 6 h were 0% (0/13), 0% (0/19), 11.5% (3/26), 15.1% (8/53), respectively for 0.0, 5.0, 7.5, and 10.0 μg/mlMG-132. Oocytes with premature anaphase, polyploidy, or structural chromosome aberrations were not found. Cytogenetic analysis of mouse oocytes following in vitro exposure to MG-132, chromosome configurations are shown. (A) metaphase II oocyte, normal, n = 20 dyads. (B) metaphase I oocyte, normal, N = 20 tetrads. (C) metaphase II oocyte, hypoploid, premature centromere separation (incomplete), n = 19 1/2 (10 dyads and 19 chromatids), arrow points to one of the 19 single, unpaired chromatids. (D) metaphase II oocyte, hyperploid, n= 22 dyads. (E) metaphase II oocyte, hyperploid, single-unpaired chromatid, n = 20 1/2 (20 dyads and one single, unpaired chromatid indicated by arrow). (F) metaphase I oocyte, diffuse chromatin, N= 20 probable tetrads. (G) metaphase I oocyte, homologue separation, N= 20 (17 tetrads and 6 dyads), arrow points to one of the 6 dyads. (H) metaphase I oocyte, homologue separation, N= 19 1/2 (16 tetrads and 7 dyads). Different superscripts among proportions in the same column indicate significant (P < 0.01) differences. Proteasome activity is required for germinal vesicle breakdown (GVBD) in starfish and toad oocytes [44, 45] and for activating Xenopus oocytes [45, 46]. Also, proteasomes are needed for regulating centrosome segregation [38, 47], kinetochore structure , and sister chromatid cohesion and separation . When rat oocytes were exposed to the proteasome inhibitor MG132, proteasomes translocated to the meiotic spindle, MPF activity was sustained, and oocytes were arrested in MI with partially segregated chromosomes . Besides inhibiting proteasome activity, the peptide aldehyde proteasome inhibitors have been also reported to repress certain lysosomal cysteine proteases and calpains . The finding that MG-132 can obstruct the casein degrading activity of the calcium-dependent protease calpain  appears relevant to oocyte maturation. Calpain activity is needed for proteolysis of the c-mos proto-oncogene product pp39 mos in Xenopus oocytes , certain cytoskeletal proteins (alpha-tubulin, actin, dynamin, lamin B) in starfish oocytes , and of cyclin in Xenopus egg extracts . We report that exposure of mouse oocytes to 10.0 mcg/ml MG-132 during meiosis I led to significant (P < 0.01) increases in the proportions of MI arrested oocytes and of MII oocytes with SC and hyperploidy. Coupled with these findings was a significant (P < 0.01) decrease in the incidence of MII oocytes exhibiting PCS (Table 1). Chemical induction of MI arrest in mammalian oocytes and spermatocytes indicates cell cycle retardation which is often associated with aneuploidy [43, 54]. Although 10.0 mcg/ml MG-132 increased the frequency of MI arrested oocytes, this cell-cycle retardation may not be entirely attributed to proteasome inhibition. MG-132 can also inhibit calpains  which are needed for cell cycle progression  and cyclin degradation . Previous studies [5, 55] have shown that an inverse relationship usually exists between the proportions of arrested MI oocytes and MII oocytes exhibiting PCS. Oocytes residing in MII for longer periods of time tend to display higher frequencies of PCS; whereas, those deferred in MI spend less time in MII prior to fixation. The significant (P < 0.01) increase in the proportions of MII oocytes exhibiting PCS in controls relative to the 10.0 μg/ml group reflects the greater length of time that control oocytes spent in MII prior to fixation. We suggest that the PCS detected in MII oocytes mainly resulted from in vitro aging. As such, the frequencies of PCS noted in Table 1 would represent independent events relative to the other cytogenetic abnormalities reported. On the other hand, PCS during meiosis I can result in aneuploid MII oocytes. PCS of homologous chromosomes and sister chromatids prior to establishing proper kinetochore-spindle attachment during meiosis I increases the probabilities of both homologues going to the same pole and of equational division of sister chromatids during anaphase I. Upon normal fertilization, MII oocytes with an additional chromosome result in trisomic zygotes; whereas oocytes containing an extra chromatid would be expected to produce 50% trisomic zygotes due to random segregation during anaphase II. This situation also applies to oocytes missing chromosomes and chromatids. Experimental data support PCS as a prelude to aneuploidy. PCS of homologues during meiosis I and equational division of sister chromatids during anaphase I [56, 57] and premature separation of chromatids during meiosis II [58, 59] and mitosis [60, 61] have been shown to increase the incidence of aneuploidy in subsequent divisions. The partially segregated chromosomes found in rat oocytes exposed to MG-132 may have represented homologous chromosomes and/or sister chromatids . The origin of single, unpaired chromatids in MII oocytes has been proposed to result from premature separation of sister chromatids prior to anaphase I [56, 57]. The possibility exists that both SC and aneuploidy may have originated from PCS of homologues and sister chromatids during the MAT of meiosis I. Upon removal of MG-132 from the culture media during meiosis I and the subsequent resumption of OM and proteasomal activity, faulty kinetochore-microtubule attachment accompanied by degradation of cohesion proteins could conceivably lead to PCS of homologues and sister chromatids. Following anaphase I, a probability exists that both homologues and sister chromatids could randomly assort to the same pole and result in SC and aneuploid MII oocytes. Although the frequency of homologue separation increased with MG-132 dose, the sample size of 11 oocytes is much too low to comment about their possible origin or their influence on other abnormalities detected in MII oocytes. The possibility exists that the observed homologue separation may actually reflect anaphase onset. The finding of diffuse chromatin in MI oocytes continuously exposed to 25.0 and 50.0 μg/mlMG-132 may be related to the sustained elevation of MPF activity noted in rat oocytes exposed to MG-132  and the stabilization of polyubiquitinated proteins and enhanced deubiquitination of nucleosomal histones in chromatin following proteasomal inhibition . The findings of the present study indicate that transient in vitro exposure of mouse oocytes to MG-132 is associated with abnormal chromosome segregation. However, additional data are clearly needed to further investigate the roles of calpain proteolysis and proteasome-mediated proteolysis on chromosome segregation as well as the numerous other potential molecular mechanisms of aneuploidy. Female, ICR (Harlan Sprague-Dawley, Indianapolis, IN) mice between 26–33 g (8–12 wks of age) were used in all experiments. They were housed under ambient temperature of 21–23°C, relative humidity of 50 ± 5%, and a 12-h light/12-h dark photoperiod. Feed and water were provided ad libitum. This research was approved by the Louisiana State University Health Sciences Center Animal Resources Advisory Committee. For each replicate experiment, five similarly treated mice received an intraperitoneal injection of 7.5 IU pregnant mare serum gonadotrophin (Dr. A.F. Parlow, National Hormone & Peptide Program, Torrance, CA) to augment the number of maturing follicles. Forty-six h later, the mice were euthanized by CO2 inhalation and their reproductive tracts placed into Waymouth culture medium (Gibco, Grand Island, New York, No. 11220-035). The ovaries were isolated and cumulus-oocyte complexes (COC) were liberated from antral follicles. The COC were then transferred to a 35 × 15 mm culture dish (Falcon No. 1008; Becton Dickinson, Co., Lincoln Park, NJ) containing 3 ml of complete culture medium (Waymouth medium, 942.7 ml, [Gibco No. 11220-035]; fetal bovine serum, 50 ml, [Gibco No. 16000-036]; penicillin-streptomycin [10,000 U/ml each of penicillin G sodium and streptomycin sulphate, 5 ml, [Gibco No. 15140-122]; pyruvic acid, 2.3 ml [Gibco No. 11360-070]; and 1 μg/ml FSH [NHPP, lot AFP-7028D]) and incubated at 37°C in a 5% CO2 gaseous atmosphere. A stock solution of 150 μg/ml MG-132 (Z-leu-leu-CHO; Calbiochem, La Jolla, CA; No. 474790) was prepared in Waymouth medium containing 7.5 μL per ml. dimethylsulfoxide (DMSO) as the solvent. MG-132 is a peptide aldehyde that inhibits ubiquitin-mediated proteolysis by binding to and inactivating 20S and 26S proteasomes [49, 62]. Although 1–10 μM MG-132 inhibited first polar body extrusion in rat oocytes, its activity is reversible . We conducted preliminary experiments to obtain a MG-132 dose range that would transiently perturb or inhibit OM during meiosis I while enabling oocytes to complete OM following washing out of the compound. Data from oocytes cultured in either 0.0, 0.5, 5.0, 25.0, or 50.0 μg/ml MG-132 from one h after initiating the culture until 17 h later showed that the two higher doses completely blocked oocytes in MI. On the other hand, when oocytes were exposed to these same MG-132 doses from one h after initiating the culture until 6 h later when the chemical was washed out (4X) and cultured for an additional 17 h in media without MG-132, oocytes exposed to 25.0 and 50.0 μg/ml MG-132 were still arrested in MI. Thus, data from these preliminary experiments enabled the selection of a protocol in which oocytes were placed into complete culture media and incubated for 1 h prior to adding either 0 (solvent only), 5.0, 7.5, or 10.0 μg/ml MG-132. Six h later, the MG-132 was washed out of the media by rinsing the oocytes four times in complete media without MG-132 and then re-incubated for 17 h. Under this protocol, oocytes were exposed to MG-132 during meiosis I and the subsequent 17 h culture time provided sufficient time for the oocytes to overcome the MG-132-induced meiotic block and progress to MII. Control oocytes were cultured in 7.5 μl DMSO per ml complete media and processed in the same manner as those exposed to MG-132. Oocytes were collected and processed according to a mass-harvest procedure  and chromosomes were C-banded  to distinguish between complete dyads (MII chromosomes) and disjoined dyads (single chromatids). In each cell analyzed, the number of chromosomes and/or chromatids was counted at 1000 × magnification to provide data for calculating aneuploidy. The number of hypoploid (n = 10–19 1/2), haploid (n = 20), hyperploid (n = 20 1/2–29 1/2), and polyploid (n = 30–40) MII oocytes were recorded. An oocyte classified as 20 1/2 contains 20 dyads and one chromatid or one-half dyad. The frequencies of each ploidy class were divided by the total number of MII oocytes analyzed excluding polyploidy. The frequencies of MII oocytes displaying premature centromere separation (PCS), single chromatids (SC), premature anaphase (PA) were also calculated relative to the total number of MII oocytes analyzed. Since MI and polyploid oocytes are distinct categories and are disregarded when computing aneuploidy, their frequencies were calculated relative to the total number of oocytes analyzed. 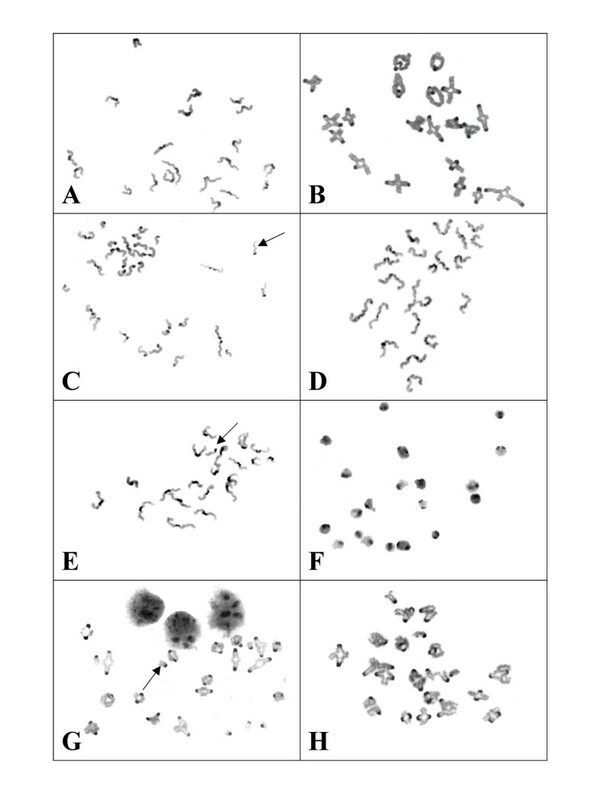 The criteria for eliminating a cell from analysis included: inadequate C-banding for discriminating between intact dyads and those separated at the centromere, overlapped or clumped chromosomes, or excessive chromosome scatter that precluded an objective analysis of numerical or structural aberrations. The frequencies of hyperploid cells were used as a measure of aneuploidy because an unknown proportion of the hypoploid cells is influenced by technical artifact resulting from excessive chromosome scatter during slide preparation. Chi-Square analysis and the Fisher's Exact Test were used for data analyses. Each author contributed substantially to the various aspects required for the timely completion of this study. Their respective efforts are reflected by the order of authorship.